Election 2019 Live: The Election Commission has served a notice to BJP's Himachal Pradesh chief Satpal Singh Satti for making offensive remarks against Congress leader Priyanka Gandhi in Solan district. The poll panel has asked him to reply in 24 hours. Election flying squad has seized 1.4 tonne of gold from Avadi check post in Chennai. According to officials, the gold was being transported to Tirupati temple. The documents said that it was for Tirumala Tirupati Devasthanam. On Monday and Tuesday, the Election flying squad and police personnel had seized about 26.5kg of gold worth Rs 9 crore and cash amounting Rs 1.20 crore in five separate incidents in the Tamil Nadu capital. MNS chief Raj Thackeray at a public meeting in Satara continued his diatribe against Prime Minister Narendra Modi and BJP chief Amit Shah and appealed to people to ensure that they did not remain in power after the Lok Sabha election. "I had earlier said that last time, Maharashtra was incautious. However, I appeal to the people of the state to remain alert now as this election is very important since it will decide whether the country will move towards democracy or dictatorship," he said. "If these people (Modi and Shah) come to power again, the lives of the people will be destroyed," he added. OLA To Provide Free Rides to PWD's for Polls | Cab aggregator Ola today said it would provide free rides to persons with disabilities (PWD) to the polling booths in association with the Election authorities in a bid to increase voter participation in the Lok Sabha Elections in Karnataka. As a part of the free service, Ola has assigned 270 cabs to the election commission which will be made available to ferry PWD voters to polling booths. DMK Vellore Lok Sabha constituency candidate Kathir Anand today urged the Election Commission to review its order cancelling the election in the seat and hold it as scheduled as he alleged the entire move to stall the poll appeared to be "politically motivated". Anand, son of DMK treasurer Duraimurugan, in a memorandum sent to the EC said if his plea for holding the polls as scheduled on Thursday was not considered he will be "constrained to initiate appropriate action," by approaching the court and also seek damages against the poll panel. AAP chief Arvind Kejriwal's tweet in support of actor-turned-politician Prakash Raj who is contesting Lok Sabha polls as an Independent candidate from Bangalore South constituency. Goa chief minister Pramod Sawant today said the Congress "imported" a candidate from South Goa to contest in North Goa constituency in absence of a capable challenger to BJP's sitting MP Shripad Naik. "Due to dearth of a capable candidate in North Goa, the Congress imported a candidate from South Goa," the CM said. The BJP today expelled Bhausaheb Wakchaure, former MP from Shirdi in Maharashtra, as he is contesting the Lok Sabha elections against the candidate of the BJP ally Shiv Sena. Wakchaure is contesting from Shirdi as an independent against the Sena's Sadashiv Lokhande. IAS Officer Suspended For Inspecting PM Modi's Chopper | Karnataka-cadre IAS officer Mohammed Mohsin was suspended today by the Election Commission of India for inspecting PM Modi's helicopter in Sambalpur. Mohsin was suspended for 'actions contrary to the instructions of the commissions regarding SPG protectees'. The NCP has expelled its Malegaon corporator Nabi Ahmed Ahmadullah after he opted to contest the Lok Sabha polls from Dhule constituency against the nominee fielded by the ally Congress. The action was taken on disciplinary grounds, the NCP said in a statement today. The Congress has fielded Kunal Patil from Dhule seat in north Maharashtra. Himachal Pradesh BJP Chief Gets EC Notice | CEO Himachal Pradesh has issued a notice to state Bharatiya Janata Party chief Satpal Satti for violating the Model Code of Conduct. He allegedly made derogatory remarks against Congress President Rahul Gandhi at a public rally in Una district on April 14. Ahead of the Phase 2 Lok Sabha polls tomorrow, a grenade was blasted in the Karbi Anglong district. There are no reported injuries so far. The police and security forces have reached the spot to conduct an investigation. 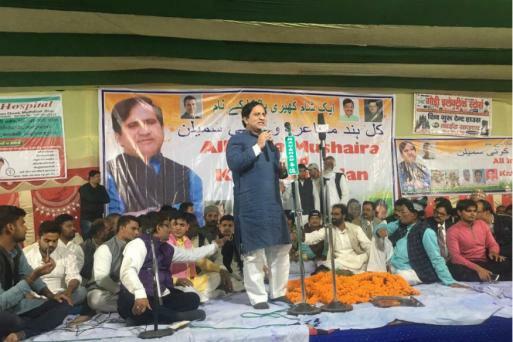 Upset after he was denied a ticket from Madhubai, which has gone to the Vikasshil Insan Party as part of the seat-sharing arrangement, Ahmad decided to contest as an Independent candidate from the Madhubani Lok Sabha constituency. The Saffron Will Get its Due Respect: Sadhvi Pragya | Sadhvi Pragya Singh Thakur today lashed out at her Congress rival Digvijay Singh, saying he "sowed the seeds" of defamation of "Sanatan Dharma". "He (Digvijay Singh) has sown the seeds of defamation of our Sanatam Dharma (Hinduism) and the saffron. He termed the saffron and Hindutva as terrorism," Thakur alleged. 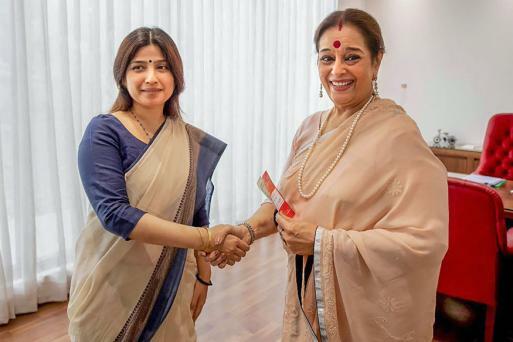 "I will ensure that the saffron gets its due respect," she told reporters after being declared as the BJP candidate from Bhopal Lok Sabha seat. "Dharma will triumph over Adharma," she added. Three Lok Sabha constituencies in Chhattisgarh, Kanker, Rajnandgaon and Mahasamund, all having Naxal presence, will go to the polls tomorrow amid tight security to decide the fate of 36 candidates. Of the 2,022 polling booths in the Kanker Lok Sabha seat, 490 have been marked as hypersensitive and 28 as sensitive. Of the 2,322 polling stations in Rajnandgaon, 279 have been marked as hypersensitive and 302 as sensitive. In the second phase of polling in the state where around 60,000 security personnel will be on duty, said the state CEO. 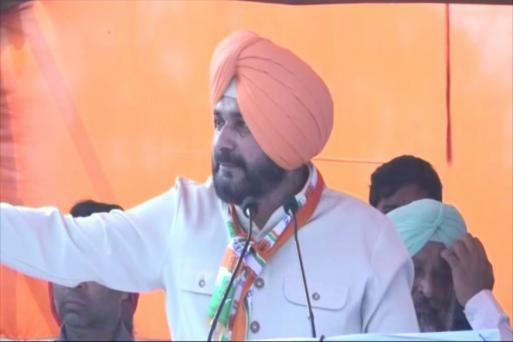 Navjot Singh Sidhu said that the BJP's strategy to divide the nation on the basis of religion is not nationalism. BJP Using Central Agencies to Harass Opposition: Mamata | Trinamool Congress supremo and West Bengal Chief Minister Mamata Banerjee Wednesday came out in support of DNK leader Kanimozhi, whose residence was searched by central agencies. "It is a shame that BJP is using central agencies against opposition leaders and parties to harass them. Yesterday the Income Tax(department) without any reason raided Kanimozhi's house. Just because DMK and its leader M K Stalin are opposed to Narendra Modi and BJP, they (DMK leaders) are being unnecessarily harassed," Banerjee said. PM Modi Raising Emotive Issues: Ajit Pawar | NCP leader Ajit Pawar today said since there was no development issue left to talk about, Prime Minister Narendra Modi was raising emotive issues like caste, which does not behove of a person holding the position of PM. Pawar made the remarks after Modi Wednesday said at a poll rally in Madha in Maharashtra that the Congress and its allies have not kept any shortcomings in abusing of my backward caste. 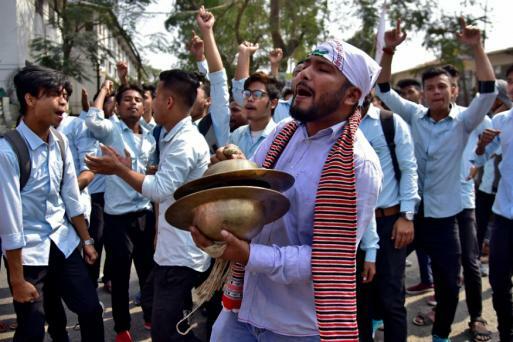 While the BJP claims the youth will vote for development and a strong leader, the All Assam Students' Union believes they will not be swayed by the saffron party's poll 'gimmicks'. 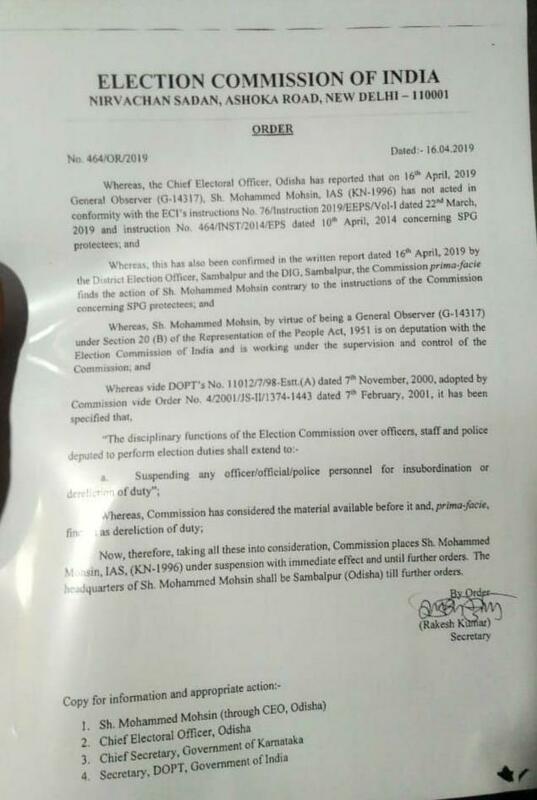 BJD Writes to EC Against BJP | The BJD wrote to the EC today filling a complaint against Odisha TV and the BJP for violating the Model Code of Conduct. The letter alleged that the television channel carried a "scrolling news" of a media byte by BJP spokesperson Lekhashree Samantasinghar and also conducted a live panel discussion with political guests on Tuesday. Indian Has 'Mother of Nuclear Bombs': PM Modi in Gujarat | Prime Minister Narendra Modi today at a public meeting in Gujarat said he did not fall prey to Pakistan's nuclear blackmail, because India has the "mother of nuclear bombs". "We have nuclear of nuclear bombs (the mother of nuclear bombs). I decided to tell them, do whatever you want to do (but we will retaliate)," the prime minister said. "In the past our people would weep, go around the world saying Pakistan did this, did that....It is now Pakistan's turn to weep," he added. As the battle lines are drawn, it's widely believed that Sadhvi Pragya Thakur with her 'hard Hindutva' would give a tough fight to Congress' Digvijaya Singh who has been pedaling with 'soft Hindutva' off late. Uttar Pradesh Congress president Raj Babbar and another actor-turned-politician Hema Malini are among the 85 candidates contesting for eight Lok Sabha seats in the second phase of elections in the state on tomorrow. Fatehpur Sikri will see a triangular battle between Babbar, BJP's Rajkumar Chahar and BSP's Shreebhagwan Sharma, who is a two-time MLA from Debai assembly constituency of Bulandshahr. In the temple-town constituency of Mathura, Bollywood "dream girl" of yesteryears, Hema Malini, is seeking re-election after winning the seat in the 2014 general elections. Twitter Blocks Yogi Adityanath's Tweets | Two tweets by Uttar Pradesh Chief Minister Yogi Adityanath with communal overtures have been taken down by Twitter following a directive from the Election Commission, PTI reported. The tweets posted on April 5 had referred to the Indian Union Muslim League (IUML) as a "green virus". The IUML had moved the commission against the tweets and had urged it to block Adityanath's twitter account. Following the news of a failed alliance understanding between AAP and the Congress, AAP leader Sanjay Singh told news agency ANI that the alliance failed because the Congress party is in no mood to compromise. AAP-Congress End Alliance Talks | The AAP and the Congress have called off all possibilities of an alliance. AAP has decided to fight polls alone in Delhi, while it will fight polls along with JPP in Haryana. Sadhvi-Digvijaya Will Fight in People's Court: Amit Shah | BJP president Amit Shah on Sadhvi Pragya Thakur's candidacy from Bhopal: "The BJP has decided to field Sadhvi Pragya Thakur against Digvijaya Singh, one who coined the term saffron terror, in Bhopal. All over the world, the Congress party has defamed India in the name of saffron terror, Hindu terror. Innocent monks have been sent to jail. Even Sadhvi was harassed. Today, the BJP is taking Sadhvi along with Digvijay Singh to the people's court." 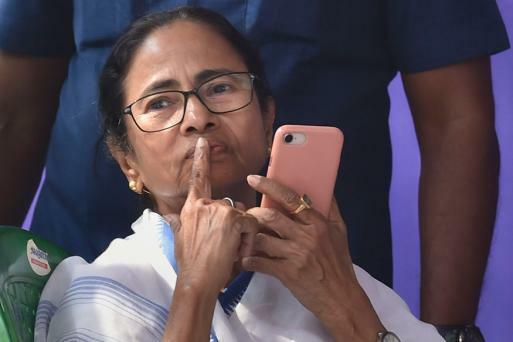 After polling in two constituencies in the first phase, three seats of Bengal province - Darjeeling, Jalpaiguri and Raiganj - are set to vote in the second phase on Thursday. BSP leader Danish Ali told PTI today that the BSP-SP-RLD grand alliance in Uttar Pradesh will play a key role in determining who will head the government after the Lok Sabha election. He asserted that the road to the Prime Minister's Office goes through the state. There is a wave in favour of the 'mahagathbandhan', which will sweep the polls in Uttar Pradesh, the grand alliance candidate from Amroha said. Yog-Guru Baba Ramdev told reporters that Christian and Islamic countries are funding the campaign to oust PM Modi. Congress candidate from Bhopal Digvijaya Singh took to Twitter to convey his greetings to Sadhvi Pragya, the BJP candidate battling him in the constituency. "I welcome Sadhvi Pragya ji in Bhopal. Hope you will enjoy the serene, educated and civilized atmosphere of this delightful city. I pray to Mother Narmada for Sadhvi ji and hope she blesses us so that all of us can walk on the path of truth, non-violence and religion," he said. Bharatiya Janata Party (BJP) president Amit Shah today defended Malegaon blast accused Sadhvi Pragya's candidature from Bhopal, saying that she is the answer to word 'Hindu terror' coined by Congress. "Rahul Gandhi and Congress cannot secure the country, they can only defame Hinduism by talking about 'Hindu terrorism' and 'saffron terrorism'. The BJP has decided to field Pragya Thakur against Digvijay Singh, the creator of saffron terrorism," he tweeted. Alliance talks between AAP and Congress were called off in the evening over disagreement on Delhi and Haryana seats. Even as reports earlier claimed that the tie-up was in the final stage, Aam Aadmi Party's Sanjay Singh said that the grand old party is not ready for any kind of compromise. "In order to stop BJP we were ready for an alliance with Congress, but Congress is not in a mood for any coalition. It is a matter of sadness, that even after so many efforts, Congress is not ready for any kind of compromise," he said. Rejecting AIADMK alliance's plea, a division bench of the Madras High Court today upheld Election Commission's decision to cancel elections in Vellore Lok Sabha constituency. In a PIL, AC Shanmugham had challenged the constitutional validity of the orders dated April 16 of the President of India rescinding the election to the Vellore constituency scheduled to take place on Thursday (April 18) on charges of rampant corruption. 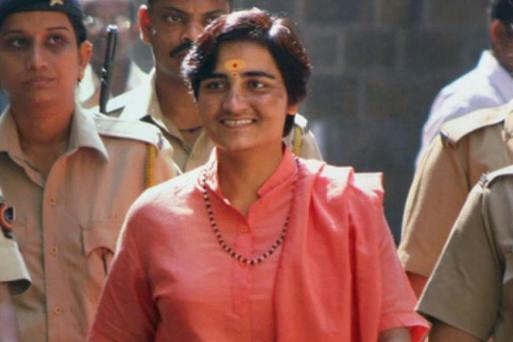 BJP has given the coveted Bhopal ticket against senior Congress leader Digvijaya Singh to Sadhvi Pragya Singh Thakur, who is facing trial in the 2008 Malegaon blast case. The announcement was made hours after Thakur joined the BJP and expressed interest in contesting the Lok Sabha election from Bhopal. Born in Bhind district of Madhya Pradesh, Thakur has had a long association with the Sangh Parivar. A post-graduate in history, she worked with the RSS' student wing Akhil Bharatiya Vidyarthi Parishad and Durga Vahini, women's wing of the Vishwa Hindu Parishad. The BJP has been holding Bhopal Lok Sabha seat, where about 4.5 lakh of the 18 lakh voters are Muslim, since 1989. According to sources, BJP leaders went into a huddle after Digvijay Singh's candidature was announced.